Project Anarchy vs Unity 3D. A comparison of two modern game engines. Project Anarchy (PA) – new free desktop and mobile game engine from Havok. In this article I’ll try to compare Project Anarchy and Unity 3D Engine and find out main advantages and disadvantages of these two engines. Project Anarchy includes two standard licence versions: Project Anarchy Free and Project Anarchy Pro. Up to this moment Project Anarchy have not clear pricing information about Project Anarchy Pro. You need to write email to support for detailed information. PC distribution extension of Project Anarchy free version. For mobile, desktop and console distribution. Project Anarchy uses C++ for native developing and Lua for scripting in editor. You can right native code plugins for both of them. Platform where engine development tools works. * – limited edition. build only. Development tools (vForge editor, exporter plugins, model viewer) not supported. Comparison between version of this engines. Project Anarchy has a lot of features disabled or missing in Unity. For now Project Anarchy is not a competitor for Unity engine for game development. In some cases it may be a better solution then Unity in mobile development. But for web and desktop development Unity is better solution now. Advantage of Project Anarchy is Scaleform GUI System, additional graphic features and a bit more powerful physic system. Project Anarchy is more complicated, not so flexible and not so easy to use like Unity. It has not Unit Store like service with a lot of extensions and assets. Also Project Anarchy is huge dependence from a Windows platform. All its development tools use Windows technologies. Unity has more cross platform architecture. Price for Project Anarchy Pro version is unknown now. 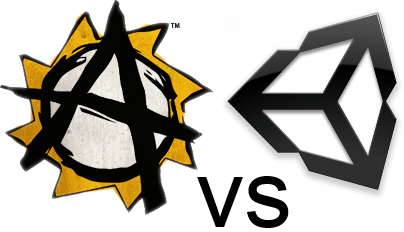 Project Anarchy features and license comparison. Discussion Project Anarchy for Linux. Discussion about Project Anarchy Pro version. DLC system inplementation in Unity. Fog of war in Unity. Video tutorial. Great comparison! I am not sure if you saw the updated information but Scaleform is now included for free with the free project anarchy download. Hello. Yes, you right. They have added Scaleform for free version licence. I updated the article. Thanks. No you did not :c check the bottom most part. I think you made a mistake! Great comparison 😉 Another advantage of PA is mod support on the PC. Unity creates a closed asset package in the build step, so offering mod support like changing textures, models and scripts can be tricky. PA comes with a packaging tool, which is optional. You can leave your asset files, or part of your asset files, open for user created content. Write a comment Press here to send a reply.